The argan tree, or Argania, is a tree of the Sapotaceae family. It dates back to the Tertiary period. 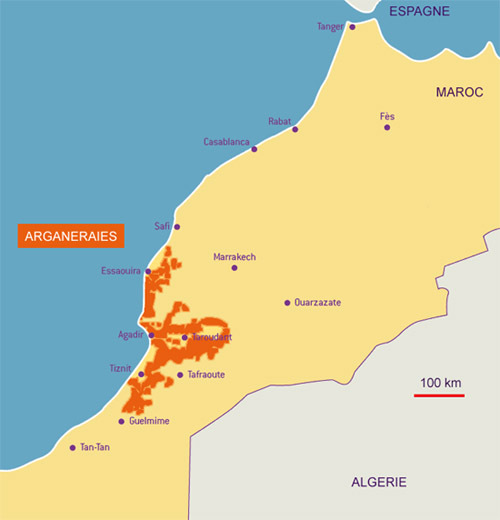 Once present on most of the territory of Morocco and western Algeria, the last glaciation has reduced its main presence to the southwest of Morocco. It is heat resistant (up to 50 ° C) and drought, thanks to its strong root system. This allows the maintenance of soil and maintains soil fertility, protecting against erosion as well as from the water or from the wind. It thus serves as a bulwark against desertification. With a slow growth, its average life span is 200 years. It can reach 10 meters height. Its trunk is gnarled and branched. Its foliage is deciduous with long sheets of 2 to 3 cm, dark green and leathery appearance which protects from evaporation. It blooms in May and June, with pale white or yellow flowers. Its fruit a long oval bay of 3 cm, yellow or brown. A pulp surrounding the core which contains three “kernels”, small kernels containing more than 50% oil. The oil is extracted from the nuts. A tree can produce about 8 kg per year. The leaves are used as fodder for camels and goats climbing on the branches to eat. The wood, very hard, is mainly used as fuel for heating, and sometimes in carpentry.